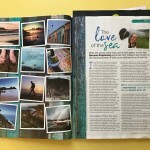 I’ve just picked up a copy of Country Walking magazine, and they’ve done a great job with my article on the ‘Love of the Sea’. 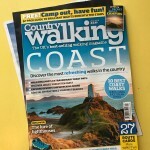 Here’s an excerpt and some pictures, and it’s in shops now if you want to read the rest, including my top ten coastal walks all around the UK. I live right by the sea, in the charming little town of Aberystwyth in mid Wales with its Victorian promenade, pier and harbour, cliff railway and seaside crazy golf. 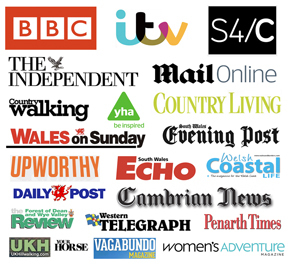 I’ve punctuated the writing of this article with short walks by the sea, which three days ago was so wild and furious that it was crashing into the harbour walls and creating vertical sheets of salt water 40ft high or more that hung in the heavy air for whole seconds, like scoured glass sculptures. Two pairs of shoes are still stiffening on the radiator after mistimed attempts to get a closer look. Today the sea is softest blue and so hazy that I can’t make out the horizon, and its frilly edge is full of swimmers, sunbathers and castle-builders. Neither sea-characters are good for the work ethic, which perversely is in part what this article is all about.